The RS Components Janus is an ergonomic crimping tool featuring self-adjusting dies for creating a trapezoid crimp profile on wire ferrules 0.14-10.0 mm2/AWG 26-8. Rotating the dies so that ferrules can be crimp from each side or the front of the tool makes it excellent for both bench work and cabinet installation. The compact design creates easy access to wires in confined spaces. The ergonomic handles, light weight, relatively low handle force and optimum handle opening provide comfortable crimping. 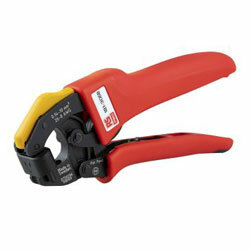 The full cycle crimp mechanism ensures a consistent, reliable crimp. The ratchet release mechanism clears mis-crimps and obstructions, and the non-slip rubber grip pad applies pressure against a surface. Each tool also has a unique serial number for traceability.